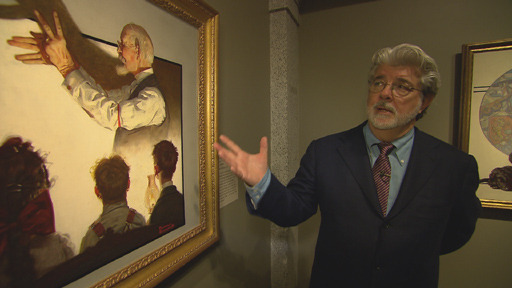 Like the Fishers, filmmaker George Lucas wanted to build a museum in San Francisco’s Presidio. Lucas wanted to bring his Lucas Cultural Arts Museum to Crissy Field – a beach-front portion of the Presidio National Park with killer views of the Golden Gate, Alcatraz, and the Bay. Lucas must be reading Eli Broad’s museum-building playbook: After Lucas’s proposal was rejected he threatened to take his museum and collection to another city. Will billionaire Lucas get what he wants by leveraging cities against one another? Remember those sweet deals Santa Monica and Beverly Hills offered Eli Broad when he was “considering” them instead of Downtown for his museum? We know how that turned out. In March, Sotheby’s held an auction in Paris of the Barbier-Mueller collection that was a flop. Gleeful announcements of new auction records and shattered high estimates have become customary in the high end art market; so what went wrong in this case? 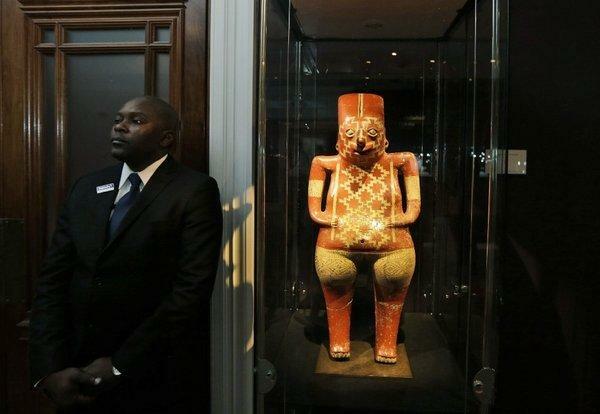 The Barbier-Mueller trove of Pre-Columbian art was created over two generations, was widely-published, and had been on public display at the Barbier-Mueller Museum of Pre-Columbian Art in Barcelona. When an arrangement with the Spanish Government to put the collection on permanent display fell through,[i] the owner, Jean Paul Barbier, decided to sell. “Grande Vénus Callipyge” at a preview in London. 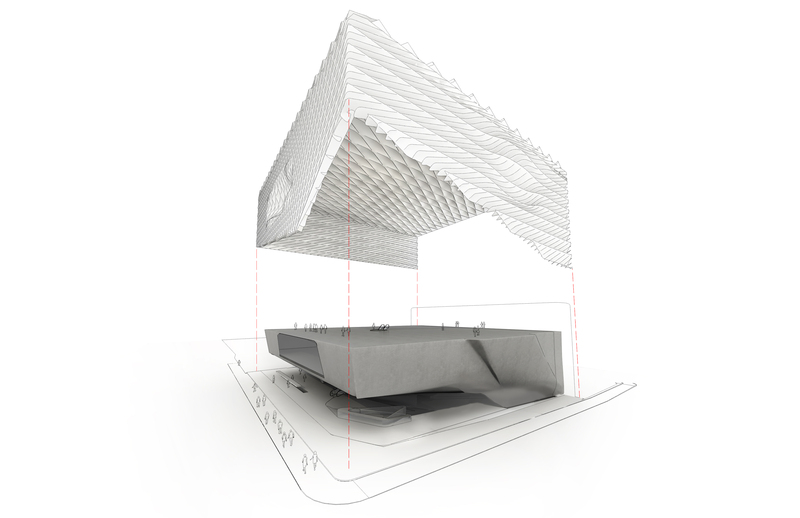 Conceptual Rendering of the “Veil and the Vault” by Diller Scofidio + Renfro. Last week, I attended (a portion) of LACMA’s 24-hour screening of the museum’s newly-acquired The Clock by Christian Marclay. I watched the video work from 8:00 until a little after midnight, and LACMA’s Bing Theater was packed the entire time. People shuffled out at the bottom of each hour, allowing more people in. When I left at 12:15, there was still a line of eager museum visitors all the way down the side of the Art of the Americas building. The Clock has been on view pretty much from the time it was acquired back in May, and just closed this past weekend. If you didn’t get the opportunity to see it, fear not, I’m sure it will be back—it’s a huge crowd pleaser. The (de)evolution of the leading lady? LACMA’s near acre of new exhibition space, the Resnick Pavilion, means LACMA has a lot of exhibitions to program. And they seem up to the task. After the three inaugural shows (Olmec, Fashion, and Eye for the Sensual), LACMA has managed to keep the Resnick Pavilion at full capacity. There are three shows currently in the space: David Smith: Cubes and Anarchy, Gifts of the Sultan: The Arts of Giving at the Islamic Courts, and LACMA’s ticketed blockbuster: Tim Burton. The shows keep with Michael Govan’s strategy for offering unrelated coinciding shows in the Resnick Pavilion. Across from the Resnick Pavilion, is Renzo Piano’s other LACMA building, BCAM; it too has been kept full. The top floor is still stocked with Broadworks, the second floor is being deinstalled from the recent permanent collection show Human Nature, and the ground floor just had one of the massive Serra sculptures deinstalled, to make room for a new Burden work, which is going to be AWESOME. I was in Houston last week for the American Association of Museum’s annual conference. It was my first time attending, and I learned a lot and networked a lot. (Thanks for the fellowship Getty Foundation!) As a Californian, my perception of Houston is a bit skewed from reality. It didn’t help that my freshman year roommate was a frat boy from H-Town, who was fond of boxed wine and drunk driving. All of my conceptions of Houston were changed during my trip. Total strangers smiled at me and made eye contact (a strange thing for me). More importantly, Houston is FULL of art institutions. I managed to squeeze a major art mecca into my trip and was blown away with the amount of things I saw. (This was easy to accomplish because of Houston’s concentrated museum district.) I got to see the Museum of Fine Arts, Houston’s traveling summer exhibition Titian and the Golden Age of Venetian Painting. It was kind of dinky, and I’m glad I didn’t have to pay the extra $7 dollars to see it. What really blew my mind at the MFAH was the Carlos Cruz Diaz show (post to follow soon); I loved it so much, I saw it twice in four days. 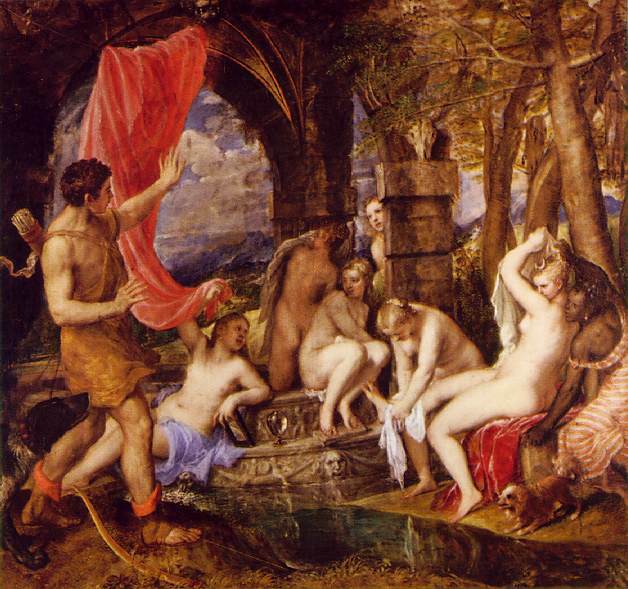 Titian’s “Diana and Actaeon” – The Painting that almost got away. It is well known fashion designers find inspiration from fine art (post on Balenciaga coming soon). Walking around the loop, I discovered advertisers of fashion are inspired by fine art as well, contemporary art even. 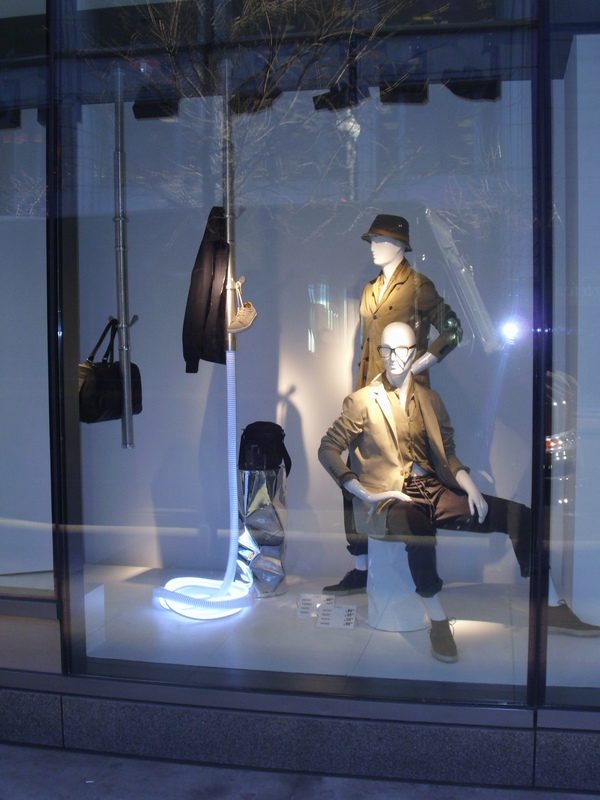 The Zara store in Block 37 has window displays that look a lot like a certain contemporary pop artist. After my two posts on museum advertising, I was blown away to see a specific, and familiar (familiar to some at least) contemporary art piece utilized in a window display of trendy clothing store Zara. The florescent lighting and metallic cylinder forms shouted “Jeff Koons!” so loud to me I almost snapped my neck doing a double-take. I’m not the only one who sees Koons here right?